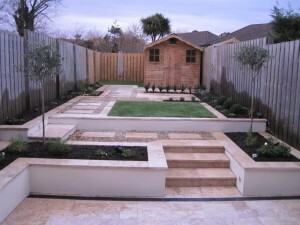 This garden design, which was for a small narrow garden, is now completed and both the Client and Garden Design Dublin are delighted with the results. 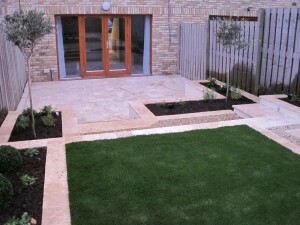 It is a contemporary garden to the rear of a new terraced house in the Shankill area of south Dublin. The previous garden had a simple deck at the back of the house, linked to a slightly sloping lawn leading to a shed at the rear of the garden. It was very narrow and uninteresting. 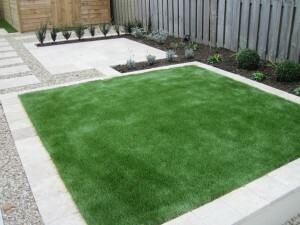 Although the client wanted an attractive garden, she did not want a lot of work and was particularly concerned about the need to mow a lawn regularly. 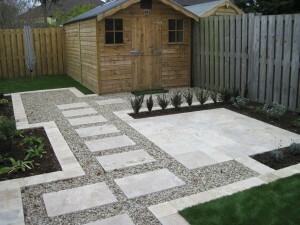 doors leading onto the patio, so the travertine will draw the house and garden together and provide an attractive seemless view from the house onto the garden. thereby not overtaking the patio or garden. small articificial lawn. 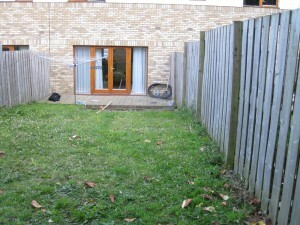 This second artificial lawn was located adjacent to the shed to allow for the placement of a radial washing line. Great Garden Design for a narrow Garden! Iberis and Salvia. 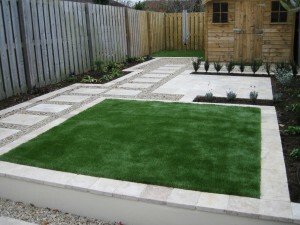 Three box balls were also added to the design alongside the lawn to add interest. Every garden needs some height in the planting and even in a small garden, trees can be choosen which will fit in perfectly and not become too large. In this case we chose the beautiful flowering dogwood, Cornus ‘Simon’s Strain’ and a japaneses maple, Acer ‘Seiryu’. We have plans to paint the surrounding fence and shed in a soft bluish/grey shade which will give a lovely backdrop to the garden and planting and finish the design. Some of the photo’s in this blog were taken just after watering the garden and when the light was fading but I think still show the beauty in the design and finished garden. It is already a beautiful garden, which I am looking forward to seeing maturing into a wonderful, yet easily manageable and very attractive garden. If you would like your Garden designed by Garden Design Dublin, call Claire on 087 2334631 or email claire@gardendesigndublin.ie now.